The large 230mm (9") polishing head on this random orbital polishing machine is a great aid to quickly buffing up your car. 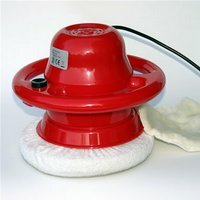 Its smooth operting 110 watts motor results in even polishing without hotspots and comes supplied with a 4 metre cable and plug plus 2 polishing bonnets. Additional bonnets are available from us. Made of high impact, durable ABS on the outer, which has an all round, 360 degree handle for easy grip. The unit weighs 2.8kg. This car polishing machine is TUV and CE approved.